The legacy of Spirit sets the standard for excellence! Established in 1987, UCS/Spirit Vaulting poles come directly from the most experienced, knowledgeable and dedicated team in the sport. Since it’s first appearance in competition UCS/Spirit Vaulting Poles have an unsurpassed history of dominating performance and results at all levels of competition. From local youth, club, high school competitions to multiple world records and Olympic medals – UCS/Spirit Vaulting Poles offer the most reliable, durable, consistent, and proven Vaulting Pole in the World. 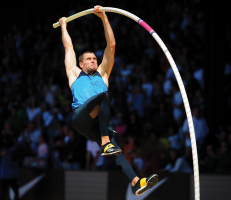 Pole Vault Crossbar GETRA Polyester "target"